Lagonda's striking new model range for 1936 was unveiled late in September 1935, designated the Lagonda LG45, an abbreviation of the new company name of L.G. Motors and 4.5 litres. Offered in three body styles or as a bare chassis for those requiring bespoke coachwork, the car was based on the 10' 9'' wheelbase ZM type chassis, the LG45 representing the best of both the Rapide and M45A models, and featured softer and longer road springs damped by Luvax linked hydraulic shock absorbers, the trend for more comfort which the company now followed. The radiator was similar to that used on the Rapide, and the Girling braking system was retained. 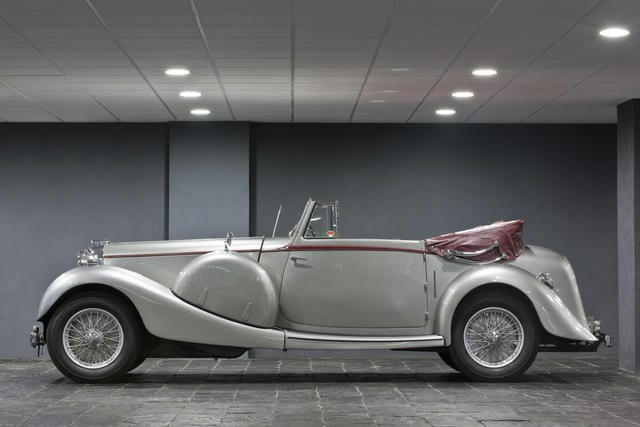 The engine was further refined and quietened, a Meadows gearbox employed, but it now incorporated a Lagonda-designed and manufactured synchromesh on third and top gears. The result was a car which, after being overseen by the talented and brilliant designer Frank Feeley, combined luxury with sports performance in exactly the way that customers had come to expect. Model range revisions were reflected by 'Sanction' numbers, the Sanction One of 1935/6 having the same engine as the M45R, but with a lower compression ratio of 6.8 : 1, while the Sanction Two of 1936 introduced twin Scintilla Vertex magnetos. The later Sanction Three of 1936/7 used an improved cross-flow inlet manifold, cast intregally into the cylinder head, onto which the carburetors were now bolted directly. The Sanction Three also featured a lightened flywheel, allowing 4,000rpm, and a stabilising bar linking the spindles of the rear shock absorbers so as to prevent any oscillation at the back. The Sanction Four was similar in many ways to Sanction Three, fitted to the new LG6, producing about 130 bhp. A super cool Urraco presented in the best colour.